This is momentous news indeed. Many have been waiting for this day and now it is here. Having read the manuscript, and knowing Bouyer's eminence as a theologian, observer, and writer, I can vouch for the importance of this book. It is one of the few publications about which one can simply say: just get it and read it. You are in for quite a treat (or maybe I should say, quite a ride). We have John Pepino to thank for a superb translation. LOUIS BOUYER was a major figure in the Church of the last century. These memoirs, which Bouyer wrote in a humble and humorous vein — though without withholding his notoriously sharp pen when needed — allow the reader to enter with him into the great events that shook the Church and the world during the era of upheavals and transformations through which he lived. They amount to an intelligent, sensitive, and pious man’s fascinating chronicle and deep reflection on Christianity’s life and travails in a world committed to modernity. 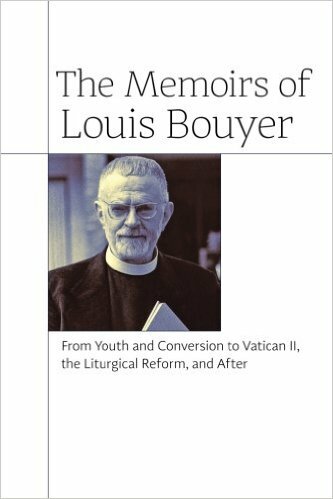 Bouyer here tells us the full and varied story of a life devoted to the discovery of the sources and Tradition of the Church in doctrine, spirituality, liturgy, and scripture. We follow Bouyer’s journeys from his inherited Protestantism to the fullness of the Catholic Faith, from his position as a Lutheran pastor to the priesthood in the Oratory of France, from humble parish life to the Olympian heights of his official theological and liturgical collaboration (and difficulties) before and after the Council with such influential figures as Congar, Daniélou, de Lubac, Bugnini, and … Joseph Ratzinger (Benedict XVI). Bouyer paints the lush landscape of a century’s illusions and disenchantments; his memoirs are essential for understanding the history of the Church during that momentous time.